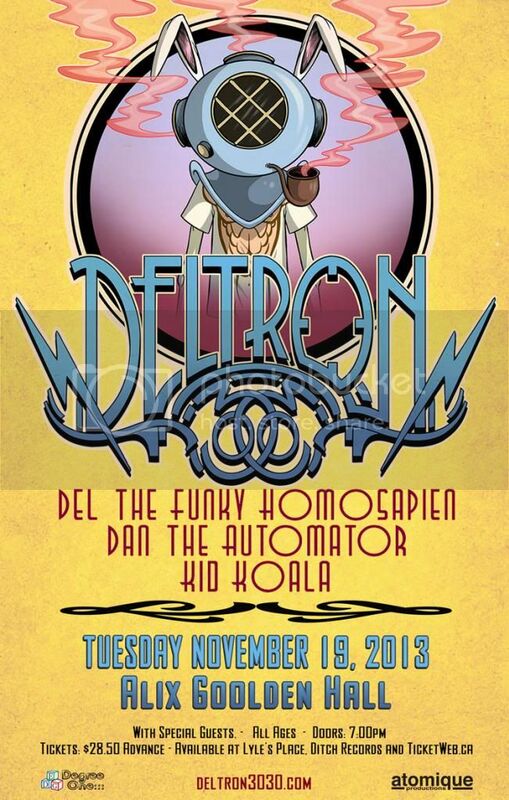 DEL THE FUNKY HOMOSAPIEN, DAN THE AUTOMATOR & KID KOALA. Composed of a trinity of alt-rap all-stars: Master lyricist Del The Funky Homosapien, virtuoso turntablist DJ Kid Koala and superproducer Dan “The Automator” Nakamura. Individually, they stand at the top of their respective musical disciplines; together, on the eponymous Deltron 3030, they warped space, bent time, transcended genre and blew minds, creating an album that still stands today as one of the most important records in the annals of underground hiphop. Critics called it a masterpiece — both timely and avant garde: “Exactly what you might expect from such a teaming: a wildly imaginative, unabashedly geeky concept album,” said AllMusic.com. “It’s not only one of the best albums in either of their catalogs, but one of the best to come out of the new underground, period.” Pitchfork called Nakamura the “poet laureate of creepy, oppressive beats,” describing the album as an “exciting” reimagining of “the future from the bottom up” that reveals Del as a “surprisingly acute social critic.” Now, over a decade later, they’re finally releasing the long-awaited followup to their debut — an album titled Deltron 3030: Event II.